CHATTANOOGA, Tenn.--(BUSINESS WIRE)-- Employee benefits provider Unum (NYSE: UNM) finds that nearly half (45 percent) of 25-34-year-olds reported feeling stressed or worried when thinking about life insurance, compared to just 29 percent of those 35-49. Women were significantly more anxiety-ridden about life insurance, with 37 percent reporting feeling stressed or worried compared to just 23 percent of men. These results and other key findings were part of an online poll among 1,226 working U.S. adults conducted by Unum in July. 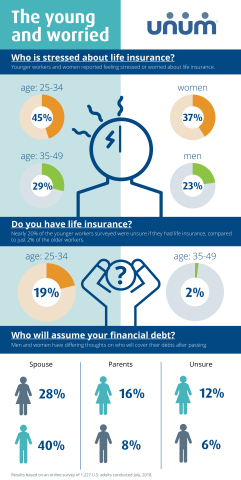 This consumer insight coincides with Life Insurance Awareness Month, promoted annually by the nonprofit organization, Life Happens. Nearly a fifth (19 percent) of the younger workers weren’t sure if they had a life insurance policy compared to just 2 percent of those ages 35-49. When asked how they would pay their bills if the primary wage-earner were to die, responses among the younger workers included credit cards (37 percent), loans from family or friends (13 percent) and bank or payday loans (10 percent). A third of younger workers (33 percent) said they were unsure of how they would pay their bills. Respondents ages 35-49 said they would pay bills with credit cards (21 percent), loans from family or friends (8 percent) and bank or payday loans (4 percent). Forty percent of those ages 25-34 didn’t have a life insurance policy because they felt they didn’t need one, it was too expensive, or for other reasons, compared to 34 percent of those ages 35-49. When asked who would assume their financial debt upon their passing, 40 percent of men and 28 percent of women said their spouse. A larger percentage of women (16 percent) than men (8 percent) said their parents. More women (12 percent) than men (6 percent) said they were unsure. A significantly higher number of women (29 percent) than men (20 percent) were unsure of how they would pay bills if the primary wage-earner were to die. More women (48 percent) than men (31 percent) believed they needed lower levels of life insurance ($100,000 to $250,000). According to life insurance industry group, LIMRA, nearly half of U.S. households are underinsured, with the average coverage gap of $200,000. Additionally, the group says most households need about five years of income replacement from life insurance and/or savings1.